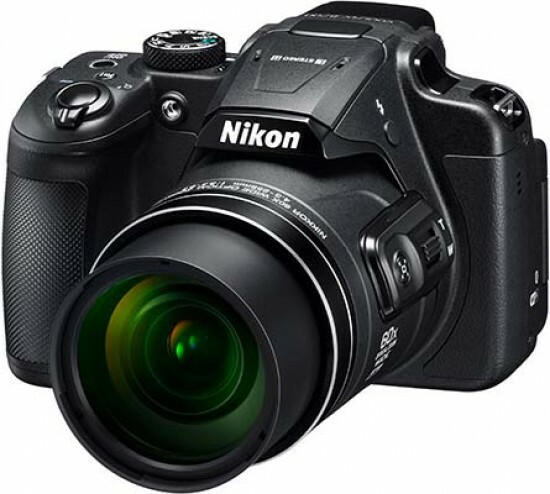 The Nikon Coolpix B700 is a bridge camera with a 20.3 megapixel back-illuminated CMOS sensor which is paired with a 60x optical zoom. You can also activate a digital zoom up to 120x. It offers a range of shooting modes, including manual control, and it can also shoot in Raw format. Like many of Nikon’s most recent cameras, it features SnapBridge technology, which allows you to maintain a constant Bluetooth link with your smartphone to send images across as you take them, ready to share on social networking sites and the like. Other interesting features include a 3.0-inch tilting screen, inbuilt Wi-Fi and 4K video recording. The Nikon Coolpix B700 retails for £359.99 / €469.95 / $499.95. Want to get closer to your photographic subjects from afar? As in really close? Announced last year, we’ve finally wrestled a 20.3 effective megapixel 1/2.3-inch CMOS sensor (21.14 million pixels total) incorporating Nikon Coolpix B700, an impressive 60x optical zoom bridge camera (extendable to 120x digitally), on to our PhotographyBlog test slab. Available in sober black (the version we had) or shiny, shiny red, unsurprisingly this is a versatile beast. The lens provides the 35mm equivalent reach of 24mm to 1440mm with available aperture stretching from f/3.3 to f/6.5, and, despite that whopping focal range, the camera is not as hefty as you might expect as a result – even though, undoubtedly, it’s more one for the shoulder bag than the back pocket. Measuring an official 125x85x106.5mm, it weighs 570g. Lens reach aside, key features include a 20.3 megapixel resolution, the latest must-have of 4K video capture at 30fps (with stereo sound), the ability to shoot Raw files alongside JPEGs, a 3-inch, 920k dot resolution vari-angle LCD monitor (Which proves pretty useful), as well as, satisfyingly, an eye-level 0.2-inch electronic viewfinder. Both of these last features sport a 921K-dot resolution. UK manufacturer’s asking price is £359.99, which, whilst not inconsiderable, at least feels fair. 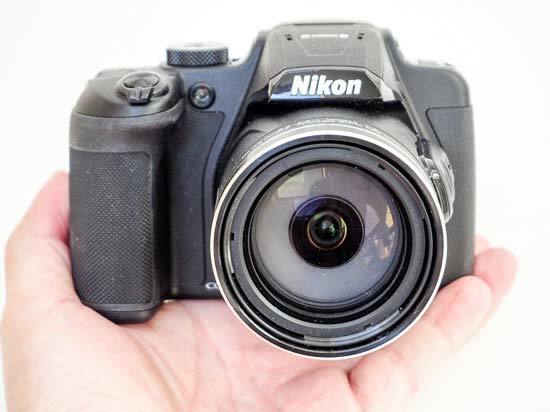 Over the couple of weeks we’ve had the Nikon Coolpix B700 to play with, we found ourselves using it on those occasions when taking a DSLR along might have proved a tad bulky and indiscrete. Certainly it would be hard if not prohibitively expensive to achieve a comparable focal length with a DSLR – and of course this is the central appeal of a bridge camera or superzoom – namely as a more manageable, achievable alternative. Naturally the optical zoom here, with a lens construction comprising 16 elements in 11 groups, is image stabilized – with Nikon claiming its lens-shift based Vibration Reduction system provides the equivalent of five stops. There are also two methods of adjusting the zoom – either via the lever that encircles the shutter release button found atop the handgrip, or via a switch on the lens itself that can be operated by the thumb of the left hand when holding the camera in both to keep it as steady as possible/minimise camera shake. In this way we were able to try and avoid the picture seeming to ‘jump’ about, an inevitable occurrence when zoomed in at maximum telephoto setting. At the other end of the scale we can get as close as 1cm to our subjects in macro mode (otherwise it’s 50cm to infinity). So, the SB700 is shaping up as a truly versatile jack-of-all trades camera, if you're looking for the convenience of an all-in-one. Naturally, while specification might make the Nikon Coolpix B700 look good on paper, it's the performance that counts. And here the SB700 is no slouch, thanks to a swift start up time that Nikon officially places at 1.3 seconds, with a 0.09 second auto focus response upon a half squeeze of its shutter release button, the Nikon deploying contrast detection AF. 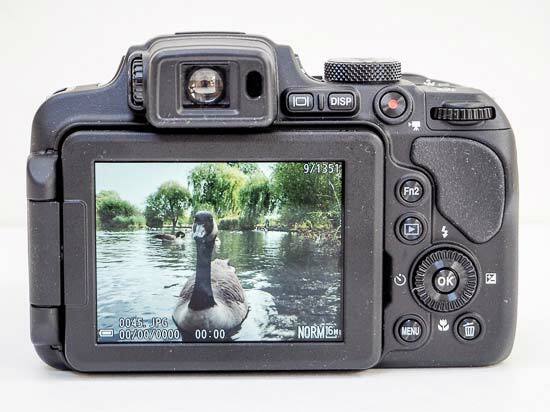 Images and video is written to removable SD, SDHC or SDXC card, with available ISO range modestly ranging from ISO100 and 1600 in full auto mode, or up to ISO3200 if in any of the P, A, S, M options selectable with a twist of the top plate shooting mode dial. From the front then, the Nikon Coolpix B700 appears pretty conventional in its design and control layout; Nikon hasn’t thrown the baby out with the bath water here. Like every superzoom camera, ever, this model resembles a more miniature version of a DSLR, complete with pop-up flash sitting above the lens which dominates proceedings, and an AF assist/self timer lamp sitting in the gap between said lens and its handgrip to the left, if viewing the camera lens-on. As we mentioned we also get a zoom slider on the side of the lens barrel itself for adjusting its focal length on the fly, plus a button for temporarily pulling back from your subject – useful if you’re tracking action or wildlife and you momentarily lose them from your tight framing, when zoomed in fully. Just above these controls, sitting beneath the spring-loaded pop up flash, is the button for raising said bulb. Give this a press and the flash immediately reveals itself. Interestingly, Nikon has embedded the B700’s built in stereo microphone in the hood of this flash. In operation, the rugged feel, rubberized handgrip is sufficiently large to wrap three fingers around, whilst a forefinger hivers over the shutter release and the thumb comes to rest at a slightly curved rubber pad at the back. Falling under forefinger or thumb on the top plate is the partially recessed on/off button that is momentarily illuminated by a cool green light encircling it when activated (this light also blinks when the camera is being charged). Press the power button and with a low familiar buzz the lens extends slightly from within its protective housing to arrive at maximum wide-angle setting. Half squeeze the shutter release button and AF points illuminate in green on the back screen or eye level viewfinder, which usefully and impressively at this price comes with an eye sensor, meaning that a separate button press isn’t required to switch between them, even if there is a brief pause while the camera registers the fact. The shooting mode wheel, with stiffened feel and ridged edge, features 11 options including standard P,A,S,M selections alongside pre-optimised auto settings. Whilst this, and a command dial that falls under the thumb of your right hand as you grip the camera, both suggest a DSLR ‘lite’ in terms of handling, the rear plate buttons more noticeably match that of a consumer compact camera. Whilst we get self explanatory ‘display’ and red video record buttons towards the top of the Nikon Coolpix B700 back where they fall readily under the thumb, just below these are even smaller buttons for playback, as well as menu and a dedicated delete control. A four way control dial with rotating edge/scroll wheel also has a familiar ‘OK’ button in its midst for implementing any user selections. Unsurprisingly, most of the real estate on the backplate of the camera is taken up with its convenient flip out and twist LCD monitor. Above this is positioned the eye level electronic viewfinder with dioptric adjustment wheel located at its top left for the shortsighted. We do get a dedicated button over on the opposite side of said viewfinder for activating it and switching off the LCD below – but as we say there is also a built in eye sensor that does this for us. 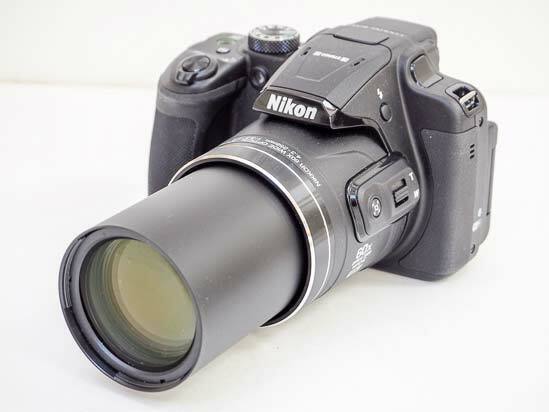 The LCD moved outwards from the back of the Nikon Coolpix B700 in a 180° arc and can, alternatively, be turned so that its screen is facing inwards to the body for an added degree of protection when transporting this Nikon. When fully extended the screen can also be flipped to face the subject for timed group shots or the ubiquitous selfie. The screen here isn’t a touch screen – nor was it expected to be, although this would have been a nice ‘touch’ when reviewing shots previously captured, or if wanting to ‘direct’ focus to a particular portion of your compositional frame with a mere tap of the finger. What is impressive, however, is the amount of battery life we get from a full charge of its lithium ion cell. Here this betters the performance of an average compact system camera and almost matches a consumer grade DSLR, with up to 420 shots available (or provides enough capacity for an hour and a half of video). The battery slots into the base of the camera, next to a vacant slot for an SD card; adjacent to this, centrally placed, is a screw thread for a tripod. In short then, the B700 would seem an able candidate for anyone needing that bigger/longer lens reach without spending an absolute fortune – or having to engage in an upward learning curve if trading up from a snapshot camera or smartphone. Whilst the Nikon Coolpix B700 bridge camera handles quite capably, how does the camera fare in terms of image quality, which is, after all, why we’re buying the thing. Read on to find out!